I took the opportunity to have one final walk around near the hotel, the park and the marina. Come Midday it was time to check out. My flight wasn’t until 4pm so there was no hurry but I was carrying two heavy bags including a lot of Kerryn’s stuff there was no sense staying, and I don’t like taking chances with airports, especially after taking one on the way to Heathrow (which turned out fine), I didn’t want to risk it twice. When I got there the computers were down, which meant a lot of waiting then a very rushed check-in, which in turn meant my planned relaxed lunch became a quickly-scoffed sandwich. The flight was good, just as good as the one coming in although instead of feeling excited about the week ahead I had that strange mix of melancholy and satisfaction you get from a good holiday. Glad to be rested, happy to have had such a great 5 days, but strange to think I wouldn’t see Kerryn & Dave for 9-10 months, not to mention the thought of having a 3-hour drive home after the flight and then back to work the next day. A top tip if you’re flying into Heathrow: The approach often brings you in from the East, heading West directly over the city. I make a point of taking a window seat on the right side of the plane, making sure to sit away from the wings, hoping they fly this route so I can watch the city passing 3000 feet below (eventually… after sitting in a holding pattern over Kent for ages), and especially on this journey ten days before the Opening Ceremony I wanted to see the Olympic Stadium in its final preparations. Unfortunately this time there was so much cloud I couldn’t see a thing. Those are the breaks sometimes! When you get accustomed to a different place, which takes a day or two, landing back in the UK can be a bit jarring. Thankfully the new passport face-recognition booths were flawless and I was through immigration in next to no time. I don’t know what the fuss in the papers is all about. The whole process from landing to reaching my car was faultless for me. Then as soon as I got into arrivals I saw all the Olympic paraphernalia! There was a Media Zone with cameras for arriving athletes, Olympic direction signage, pink and purple-clad helpers offering assistance, and even a Swedish female pole vaulter complete with a pole in a box. Thoughts immediately turned to the month ahead – exciting! If you fly to Vigo or anywhere in Spain I highly recommend Vueling, the seats are so comfortable and you get a nice amount of legroom! 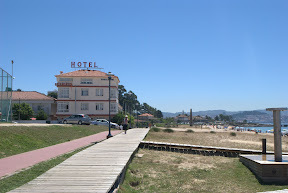 If you stay in Vigo I insist you stay at the Hotel Compostela because the people there are so friendly, and they speak English too. The rooms are a good size and the bed is really comfortable. You can sea the ria from the window and you are close to the city centre and the marina with the boat trips (and I mean 5 minutes walk to each). If you find it too loud at night with the street cleaning I’m sure they’d oblige a move to the quieter rooms at the back. I used Booking.com. 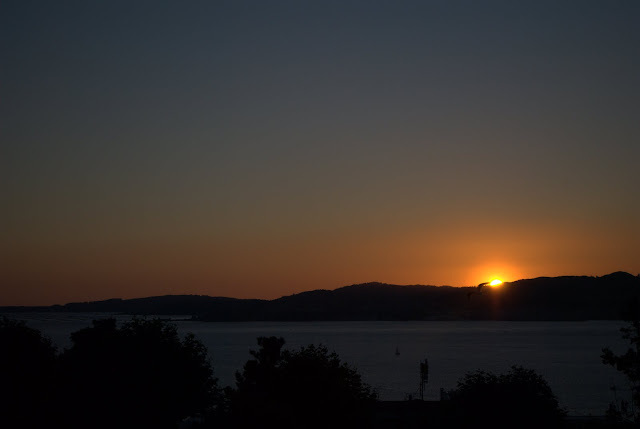 The wider area of Galicia is definitely a place you should spend the time to explore – although like a lot of places it only really shines when the sun comes out! Later in the summer I would go on to visit the Olympics and Paralympics which I will be writing about here soon, do come back for that. Kerryn and Dave were embarking on a far greater adventure. They were going to spend the next 9 months backpacking around South America! As I write this it is nearing the end of January, they’ve been there since September and plan to stay until June. They have a blog of their own – I encourage you to go back to the start and read through it! 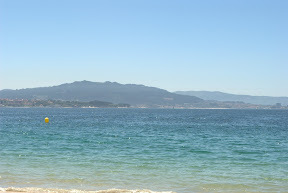 Today was my last full day in Vigo and I had the morning and early afternoon to myself. Kerryn & Dave unfortunately both had to work. After such an enjoyable day on Sunday I really fancied another boat and beach day rather than spend it walking, and it just so happened that this day was easily the hottest of my entire visit. Even the small whisps of cloud present yesterday had decided enough was enough. 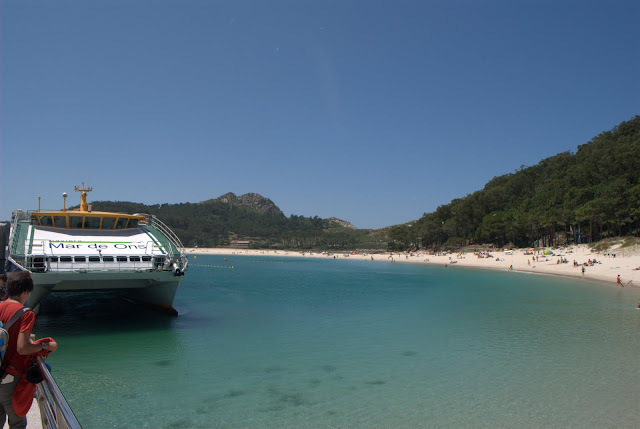 Next to the boat for the Cies is another service running to the opposite shore of the ria, to the small town of Cangas. It is a much shorter journey, maybe 20 minutes or less, and very is cheap. 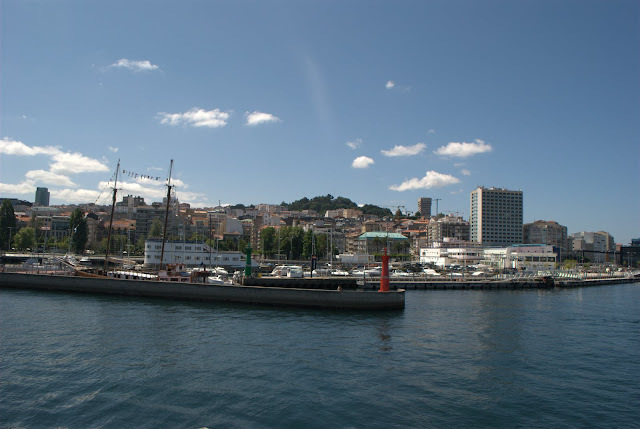 This worked well because I had agreed to meet up with Dave in the centre of Vigo after he finished work before we went to meet Kerryn, so a short journey back to Vigo would be useful. It felt like a very relaxing boat trip, it didn’t seem as hurried as the other one, just a nice easy cruise across the river in the sun. Just what I wanted. As the boat approached Cangas it became obvious it is, in places, much more colourful than some of the other places I’ve been. Of course, on a hot sunny day like this, the blues of the sea and the sky were amazing! 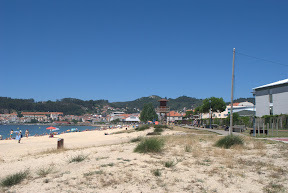 I didn’t know anything about Cangas except that it had a marina and a beach and my plan was to go and lie on the beach for a while, so that is exactly what I did. I thought if time allowed and I felt like exploring I would take a look around. The most I explored was to walk the seafront from the marina and a few hundred yards along the beach, where there were fewer people. I was surprised just how many people there were. 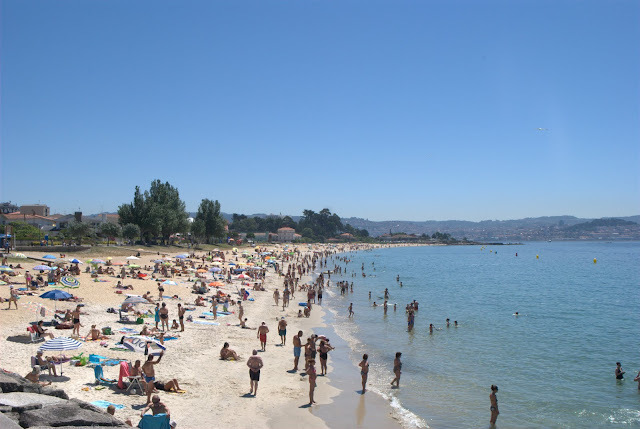 Cangas beach – I walked past the buildings in the middle of the photo, fewer people! I took off my shoes to walk on the beach and the sand was too hot to walk on! This would be my view for more than two hours. I hadn’t applied enough suncream yesterday so my ankles were already burning red, I had to keep them covered on this beach. I can never seem to tan the back of my arms and legs so I lay down for ages. I forgot how uncomfortably hard sand can be. For a while I tried to read the photography book Kerryn lent me but that wasn’t comfortable. Instead I shut my eyes and dozed for a while and just sat and watched the sea, the boats and the people. Properly relaxing stuff. 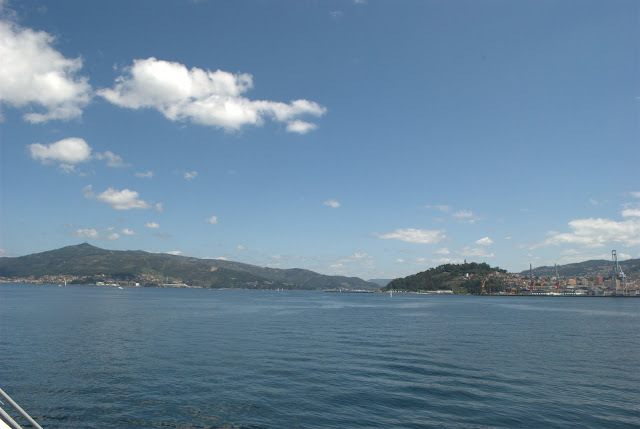 Eventually I realised it was time to go if I was to get the 4pm boat, I think it was, to be back in Vigo to meet Dave. I was all too aware this could be my last time on a hot sunny beach for a while so I enjoyed a slow walk along the beach, shoes off for a while even though it hurt (I only got halfway before they went back on again!). 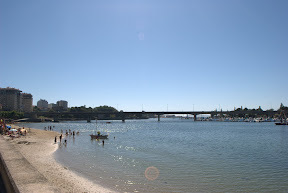 The sun really was very hot for what I’m used to and I’d used up all my drink, once I was away from the beach I’d regretted not getting something from the seller there as there was nothing for sale on the kilometre walk to the marina. People think midday is the hottest part of the day but it isn’t, that’s when the sun is strongest so you’re at risk of burning, and there’s a difference. The heat continues to build until the sun begins to set so the hottest part of the day is often between 3 and 4pm. It was something like 3.30pm when I packed up my things and I was aiming for the 4pm boat. I’d intended to speed up walking once I was back on the sea wall but in this heat that wasn’t going to happen, it felt like it took twice as long to get back as it took to get out there. I could finally understand why the Spanish like to lazily amble along the streets! It meant I missed my boat by ten minutes, I had an open return ticket and boats are every half hour, but it meant making Dave wait which was a bit annoying. I took the opportunity to sit in the shaded air-con of the marina’s cafe for a Coke on ice. It was probably the best one I’ve ever had. The boat trip back was uneventful, I was both sad to leave the beach and also happy to be moving in the wind again, and looking forward to meeting the others. Perhaps a little tired from the sun already, and the realisation hitting me that the holiday was almost over and I wouldn’t see my sister until, well, who knows when? Off the boat I rushed up to the centre of Vigo (I told you it looks better in the sun) where Dave had been patiently waiting. We caught the bus to Bouzas, the place holding the fiesta with last night’s fireworks. It just so happened that Kerryn was working there that day and there was a fair/carnival going on as part of the fiesta. Unfortunately the bus was rammed full of sweaty people and once again we had a driver who thought he was Fernando Alonso, which would be fun if we were sat down strapped in but not stood up, with few handholds, compressed in among a lot of people. Thankfully it was only 10-15 minutes away. It was quiet when we arrived, I guess it was still siesta time. Lots of street bars were set up in a square and loud music was playing. As it turned out Kerryn was a little delayed leaving so we stopped at one of the bars in the shade for another cold Coke. It would normally have been beer but I think after that bus we both agreed it needed to be a soft drink! Kerryn arrived and we wandered around the old parts of the village, mostly deserted old streets with a few people milling around. 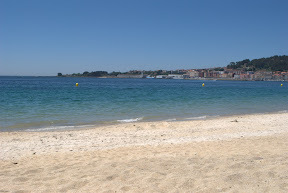 Suddenly we turned a corner and there was a little bay complete with a little beach, right there alongside the town. If you follow it around to the right, as we did, you walk along the opposite bank which leads to a footpath to the main ria where you have fantastic views over the islands and all the passing boats. The path sits between the water and a massive car park used to store vehicles made at the local Peugeot-Citroen factory before they are shipped out, don’t let that you put you off because it is worth the walk, you won’t be looking in that direction anyway! When you turn the next corner you reach a line of sculptures of marine life! And a little mini lighthouse. The weird thing about the path is it stops here. You have to turn around and walk all the way back! I think it must’ve been put in to get people to exercise, the views and statues give people a reason to come out here and they get fit along the way, which is a good idea. As we got back to the centre of Bouzas I was overheating terribly, we really ought to have brought some water with us, and I got a bit tired and irritable after being in direct sun for so many hours that day. Thankfully as we wandered around we found something to drink and I felt better again. I’d be no good in a desert. We found the fairground, set up in the streets, was just coming to life. I loved the Simpsons and Spongebob kids play areas! Enough to make you want to be 5 again. Instead we played a game of darts and all that practice on Friday clearly helped, I’m usually terrible at these games and swear they are rigged somehow, but not this time – this time I won! They were nice people too, Kerryn and Dave were chatting away to them in Spanish for a while. I had no idea what was going on. I had my pick of prizes and took home a Spanish flag as a memento of my holiday, and of course I had to pose with it with my namesake. After wandering around for a while longer and wondering whether to play more games it was decided a break was in order. We’d actually planned to have some ice cream the other day in Vigo but never got around to it, so why not go now? So we did. they had huge range to choose from – we each chose two flavours and it was bloody good, as was the cold drink. No photos.. too busy eating! As the place was next door to the hotel that was a good chance to stop for a shower and a change. Kerryn and Dave (though I think mainly Dave) put together a nice meal at their place which we ate on their balcony, which was really good. We took a load of their stuff to my hotel, which needed to come home during their upcoming travels. Afterwards we went for a walk to the marina. The cruise ship terminal and surrounding area had been redeveloped and now there’s a modern bar on the 1st floor. We went there for ‘goodbye’ drinks. There are amazing views of the ria from the balcony as again the sun was setting. 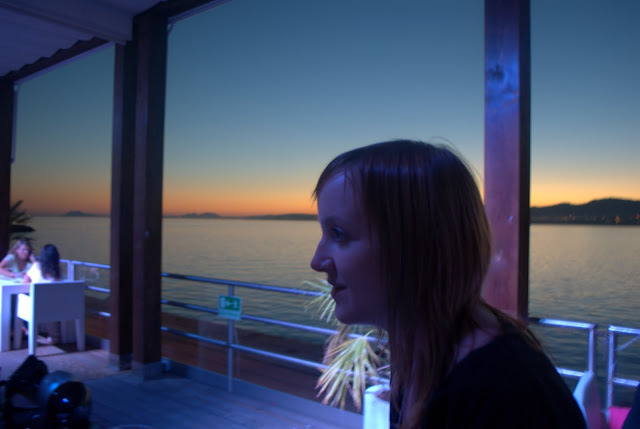 Look at the light of the sky behind Kerryn. We asked the people at the next table to take a photo of the three of us but we all had difficulty with the light, and they had difficulty operating our cameras! 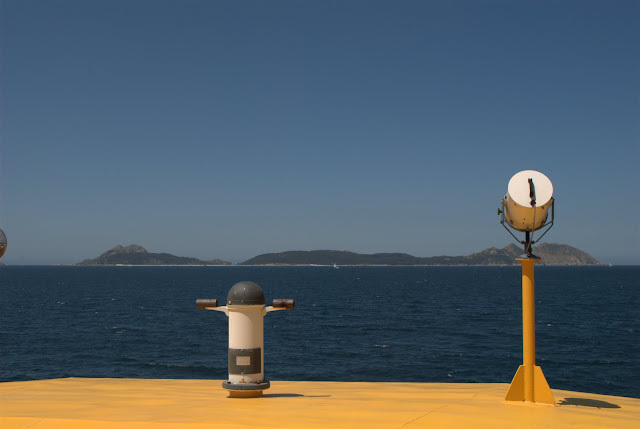 We had to laugh though, if you go there when a ship is docked you wouldn’t be able to see anything! We were lucky – the very next day a ship had docked in that exact place. We said our slightly-teary goodbyes outside the hotel, I wished them well on their travels and that was where the holiday ended, for tomorrow I was to fly home. If you’ve read my previous posts you’ll know the three of us, and definitely two of us, were drinking until beyond the small hours. You won’t be surprised to learn of a fragile head or two when we awoke on Sunday! Nonetheless we had a plan for another day trip and we were all determined not to waste the time lying about feeling sorry for ourselves, I didn’t come all this way to sit in bed, so I had to force myself up and out. We met up to rejuvenate ourselves with coffee, orange juice, some food and to get some water to take with us. It just so happened we went to the marina to the same place I went for breakfast on Friday, except this time I had the benefit of translators which resulted in a nicer brekkie! To be honest after that I didn’t feel too bad, just tired from a lack of sleep. Sunday was another bright sunny day, and noticeably warmer than Saturday had been – we were definitely going to need that water. 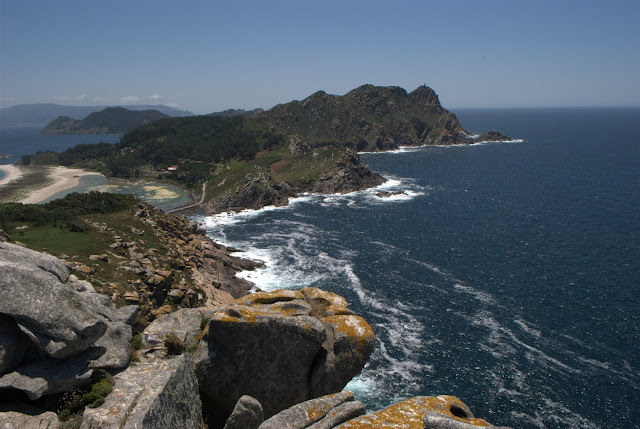 Today’s day trip a visit to Islas Cies, a small group of islands acting as a natural barrier at the entrance of the bay (or rias). It is a nature reserve, only open to tourism for two summer months every year, and I was disappointed to miss the chance to go when I was last here in April 2010. Now it was July and I had the chance to go! After a couple of busy evenings, a relaxed and sunny beach day would be just what the doctor ordered. I make no apologies for this being more of a photoblog than the others and I think when you’ve seen our destination you will agree! Glorious clear blue both above and below. The journey takes about half an hour, maybe it was 40 minutes, and the boat runs at a fair clip. Out on the water it was a lot cooler which was very much welcome, at times a little too cool! We sat outside to enjoy the sun, the views, and to take some photos of the coast of the ria. The boat slowed and drifted into a small bay, with white sand and as we approached we could see, yes, clear blue water. The beach wasn’t too busy away from the dock and nearby shop/cafe. Perfect. Rather than laze on the beach, which is kind of what I wanted to do, unusual for me but I was hot and yes hungover, we started walking along a trail through the trees. I had mixed feelings because I’d waited so many weeks for the sun I didn’t want to be out of it, yet it was hot enough I was thankful for the shade! It was a nice walk and the path was well-maintained so it wasn’t difficult, being a national park has certain benefits, and it wasn’t an enclosed space either – it was open and light and airy. It winds its way uphill and we took a fork to the left to climb further. We stopped part-way for some lunch. Along the way there were tantalising glimpses of the blue. Our destination was the highest point on the Northernmost island where we could look out on the next island along. We could’ve walked to the high point on the other island (these two islands are connected by causeways) but it would’ve taken an hour longer, I was told, and we preferred take it a little easier and give ourselves some beach time. We were looking out over the opposite side of the island to where we arrived, so we were now on the Atlantic side and you could definitely see the difference in the choppiness of the water even from this vantage point. You might recognise the view from my blog header! Looking over at the other islands as the Atlantic crashes against the rocks. Part of the beach is in the distance on the left. Up here there were some cool-looking formations in the rock too, where puddles and running water had eroded it away. We ambled back down to the beach, where the sand and sun were hot and the air was a cool gentle breeze – just how I like it. You get the benefit of the heat yet the breeze stops you from overheating. We found a spot with a few people but not too busy, well away from the main crowd but not so far as to be isolated. People bring their own motorboats and sailboats over from the mainland and they moor up along this beach. Yes, I could use some of this. One of the UK newspapers rated this as one of the greatest beaches in the world and it is hard to disagree. We must’ve stayed there for two or three hours, sleeping or dozing for most of it, with a bit of food and pesky seagulls looking to steal it. A great way to recharge. Mind you it was good job I’d brought the Factor 20 and the Factor 50 sun creams! 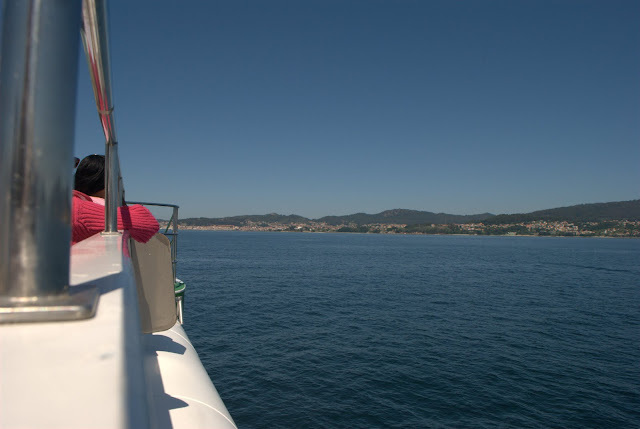 As the afternoon drew towards evening and we began to feel the chill of the wind, it was still sunny but the heat was fading, we collected our things and made our way to the boat for the return to Vigo. We had plans for later. If you ever get the chance to go to these islands you should definitely take that chance. They’re only open in July & August (or is it June & July?) although I think you can take a private boat over at other times. 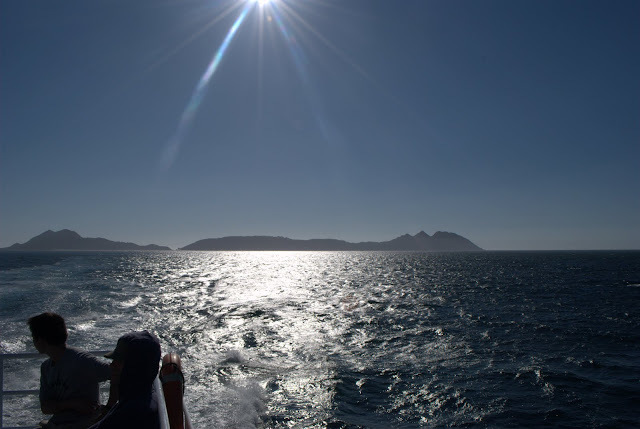 Leaving the Islas Cies, hopefully not for the last time. We weren’t quite at the top and it was lighter than it looked in this photo. Once we got to the old fort on the top of the hill we found ourselves a spot on the wall. 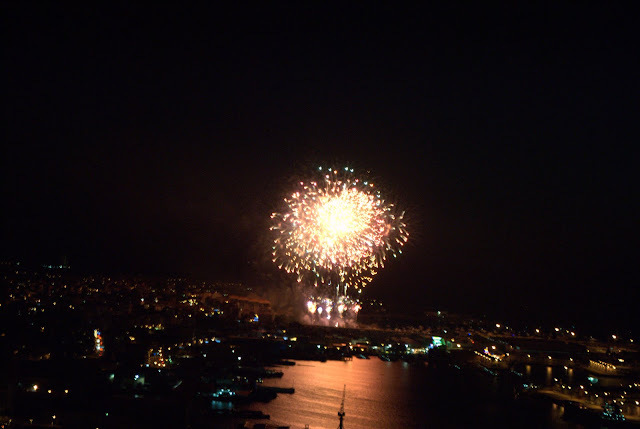 At this time of year all the towns and villages along the ria hold their annual fiestas, and they try to outdo each other with firework displays. 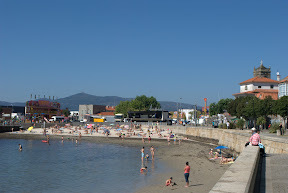 Tonight it was the turn of Bouzas, an adjacent town-turned-dockland which Vigo is rapidly subsuming into itself. 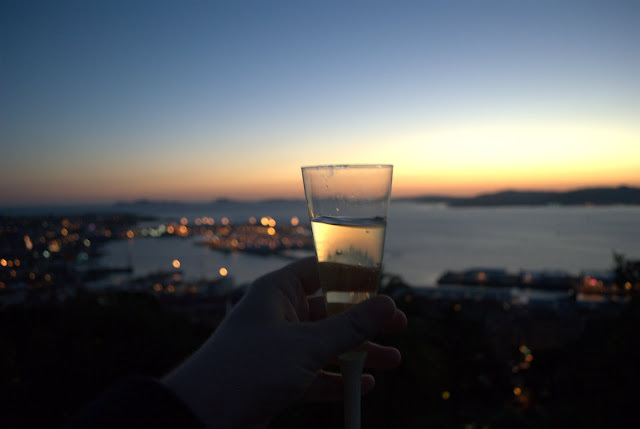 Kerryn told me that in the town itself between rounds of fireworks they break to tell a story and the whole thing is in four chapters, but it gets so full of people it isn’t fun, so why not go to the top of the hill which central Vigo has surrounded and watch from there? 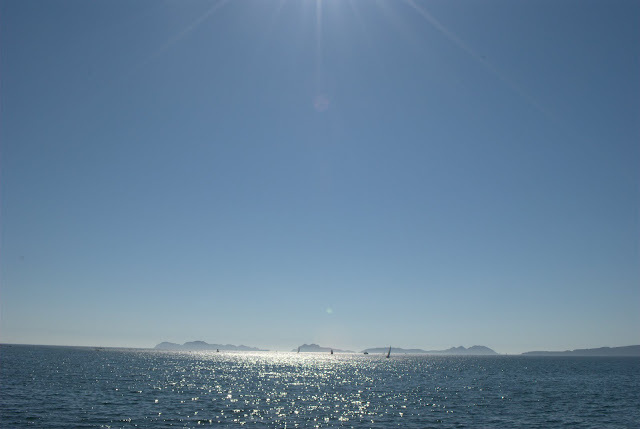 By the way, check out the view of the Cies islands from here. Of course, this being the last night of the weekend we had to bring along a little something. Then as the sun’s light really faded, and truth be told it did get a little chillier than I’d expected, the fireworks began! 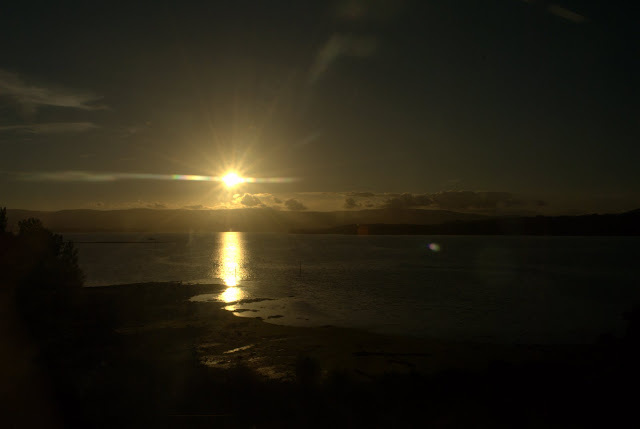 And so ended another brilliant day in Galicia! The sun! The sun is out! It had good timing too, as we’d planned a day out for Saturday: Take the train to Santiago de Compostela, about 90 minutes away, to spend the day wandering the old city. After getting to bed after 3am it was a slightly delayed, slightly hungover but mostly tired group of 3 who met up again at something like midday. It might’ve been slightly later, I can’t remember, in fact I’ve no idea if we even did anything before getting to the station. Maybe we met at the flat for a cup of tea. Fair to say I was a bit slow that morning. I’m sure Kerryn & Dave walked far too quickly for what was about a kilometre of walking, if not a mile. Anyway, we had a nice brunch at the station. I remember feeling much better after that. I remember the chocolate doughnut, that was more solid and less ‘fluffy’ than a UK doughnut which was nice. The station had moved, it was a surprise to see the old one demolished when I passed it on the bus on Thursday. The new one is a modern prefab building in a different place, an awful concrete and glass structure but it has a nice airy cafe on the inside with a nice selection of things. It was funny because while we were there the TV was showing the news and suddenly London popped up. “The Olympics are less than 3 weeks away will they be ready? Will there be more riots? Here are some random Londoners – are you excited?” It was quite funny seeing it reported in another language and that people outside the UK were making a fuss about it too, not just us and our media! Just after lunch we boarded the train, it was already after 1pm by then but that was fine. No hurry. I was on holiday and the Spanish stay up late. It was comfortable too, it had air-con (as you’d expect in a hot country) and there were reclining seats and power sockets. It was clear I wasn’t the only tired, hungover one! A lazy day on a train was a good idea. It took about 90 minutes to get to Santiago and we spent the time staring at the scenery, talking a little, playing with cameras and reading a book on photography that Kerryn had brought. 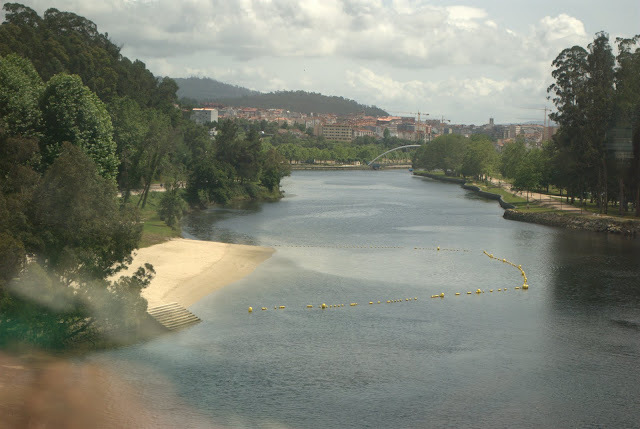 Fair to say, once you got used to the differences compared to home and moved away from the fantastic-looking bay, the inland scenery was a bit repetitive but every now and then a real gem would appear, like this one at Pontevedra. On the other hand, some of the small towns and villages we passed were looking very run-down, quiet and tatty and there were a couple of road projects which had just been abandoned mid-construction. After 90 minutes we arrived fairly well rested and emerged into the warm sunshine. 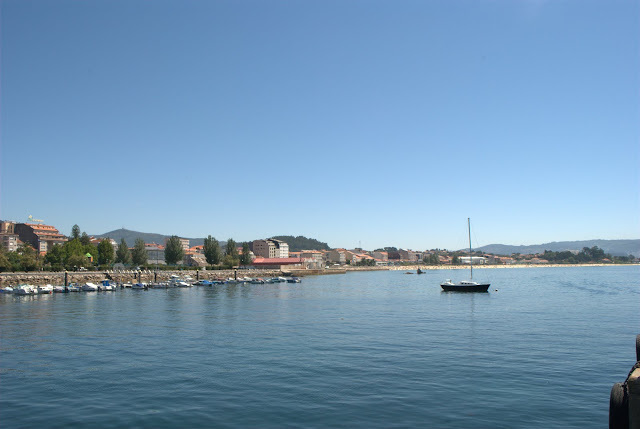 Despite Vigo being the largest city and A Coruna growing quickly, Santiago de Compostela remains the capital of the region of Galicia. When you leave the station you immediately walk uphill through typical modern Spanish streets, then suddenly you cross a road and you’re in amongst historic old buildings just like the ones in Vigo, but lots more of them. It was clear Santiago’s old town was on another scale. We took our time wandering around and Kerryn bought a local cake we all shared – almonds! Turn a corner and suddenly there’s courtyard and a tower. That’s nothing though. Just around from there is the main square and which houses the front of the same building, which is the Cathedral, and it is HUGE. Also in the square facing the cathedral is the home of the regional government of Galicia, and between them sitting opposite us is a hotel I think. 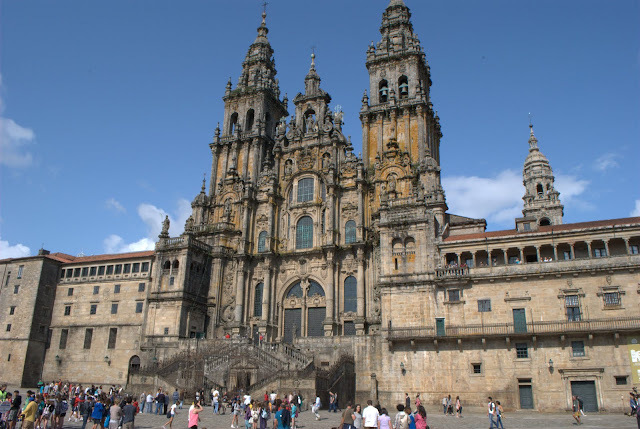 The Cathedral is the destination of the Camino de Santiago (The Way of St. James), which was a Catholic pilgrimage originating in the 9th Century. Originally you would start at your own home and walk all the way to Santiago! Nowadays it is as much a tourist journey as a religious one, so it is open to anyone wanting to complete the challenge for their own reasons. It featured in the Martin Sheen and Emilio Estevez film, ‘The Way’. The more famous of the routes is the one leading from the Pyrenees over 1000 km away! Today there are a number of starting points along the route so you can take the journey for any distance you like. Kerryn & Dave walked it from one of these intermediary points a few months prior, staying in hostels along the way, and I think they did it for about 3 weeks? There were several groups of people in walking gear with their backpacks, lots of them were school groups, as well as the usual tourists. Wandering among them were people in costume.. spot the guy in brown. We ambled around and played with our cameras. Just around the corner, down some steps we stopped for a cold Coke at a cafe. Sitting outside but slightly in the shade to get some respite from the sun. It was fantastic to feel the sun’s heat all day but you needed a break and rehydration. As we were there this guy with a guitar was in the opposite corner singing songs in Spanish, then all of a sudden we realised he was singing in English.. he was doing The Beatles. Eventually he comes over with his hat asking for money, he seemed quite well-presented for a busker but we were happy to give him some as he was very good. Kerryn & Dave talked to him in Spanish, he turned out to be a really nice guy and he said he wished he was from Liverpool just like his heroes The Beatles! Then he stood near us, dedicated a song to us and played Strawberry Fields Forever, before finishing up and walking away with a smile. We walked around for another hour or two, heading around the little back streets to explore. Somewhere we heard some loud music so went to have a look – and there was a fashion show happening in another square! We moved on, it was a bit loud. We sat at another cafe for a late lunch. A panini and a beer I think it was. Just as we’d ordered, our friend showed up! He played a few songs and worked the rest of the tables. He said hi to us and left us be. After a look along some of the shopping streets in the old town, but being mostly broke on having spent the money to get here (and with other things coming up), I didn’t buy anything. I regret not buying more local cake. A great day in Santiago. Relaxing, with enough walking to do you good. It didn’t end there. We were hungry, not hugely so but still wanted to have some dinner. We were at a bit of a loss for where to go once we were back we walked around looking for somewhere. I wanted to have something Spanish as I wasn’t sure if I’d get another chance. Tapas! A few plates of cheese and other things. And lots of red wine. Since the Galicians are proud of their local signature dish I was recommended that, I don’t normally like octopus or mushroom but I tried it and the sauce they use is amazing, it was lovely! Alas, it appeared on a huge plate and I was the only meat-eater present, we ought to have asked for a 1-person size. Nonetheless I did my best and cleared a good half of it! If you’re ever in Galicia ask for ‘Puplo a Galega’ or ‘Polbo a feira’. The net result of this was that I ate waayy too much. I think the others did too. Next stop: to meet some friends of Kerryn & Dave in a pub in the old town. A stein of beer was had. Nibbles were had. The thing to note here is that in parts of Spain when they serve you alcohol they always leave you little plate of nibbles, could be olives or nuts or whatever. In Galicia they are quite generous with them. When there are nibbles in front of me I will have them, doesn’t matter if I’m not hungry. Can’t help it. I got back to the hotel at 5am. The man on the desk said in English with a knowing smile, ‘good morrrning!’. I just shook my head and said ‘whiiiskey’ as I got into the lift. Octopus, wine, beer and a lot of Jameson’s. No wonder I was ill overnight.